On September 14, mass protests were held in Warsaw against recent anti-labour legislation. Unfortunately the unions did not call a strike. 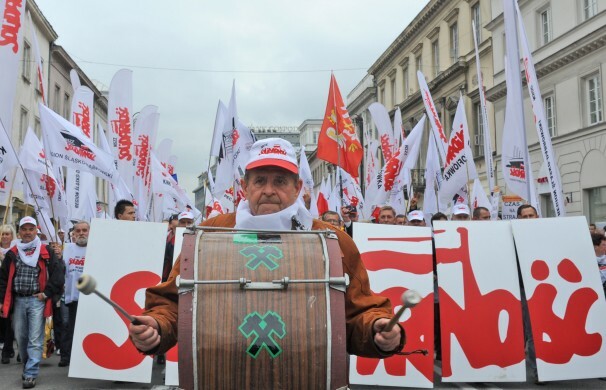 At least 100,000 people joined the demonstrations called by the three main trade unions in Poland against the legislation that basically did away with the guaranteed 8-hour working day in Poland. Despite the serious attacks against the working class, the unions backed off from calling strikes after the government threatened to do away with the system that gives them subsidized paid union jobs. It is obvious that this system is used to manage a class of labour bureaucrats who have become used to the understanding between them and the bosses: don't make trouble and we will finance your cadres of unionists. At the rank and file level, there are people ready to strike. But they are also constrained by the unions which follow the restrictive laws on strikes and take all measures possible to moderate any potential action from the workers. Some years ago there were more workers who were ready to break union discipline, but now many seemed quite demoralized. Despite the large number of demonstrators, the protests were much calmer than the ones which took place in the country 5-10 years ago. Despite the large protest, it looks like the Polish working class is still far from taking more resolute action against the attacks against it, exposing it to even further abuse and ensuring its position as a source of cheap labour for capitalists looking to dump jobs there. We can only hope some things will happen to turn the situation around in the near future. BTW, the media blackout about what is happening in Poland seems to have ended, with different newspapers reporting the protests. Unfortunately, there are a lot of mistakes. Some sources have said that people are protesting plans to raise the retirement age, even though it was raised last year, or plans to liberalize the labour law, which has already taken place. Other sources say it was a protest against unemployment, job cuts, bad economy.... Of course people are angry at all those things, but they all miss the real and immediate reason for the protests. It is very interesting how Solidarity have switched from a mass movement of anti-establishment workers to an organ of state control. The one thing I find most remarkable is the current generation of politicians is that they really do go to great effort to immortalise themselves through a trade union at the same time promoting a social engineering agenda that goes beyond their UK/USA equivelants. One thing people have to remember that being "anti-establishment" sometimes is just riding feelings against a given establishment. We shouldn't see Solidarity as a mass movement where the base created a political program. At first, the leaders were thinking of one direction, within certain presumptions of working within the limitations of the Bloc and then leaders, or at least the ones who became dominant, had other ideas. It was none other than Jacek Kuron who called in Jeffrey Sachs to make a plan for the Polish economy. This week Mazowiecki died and there was lots of criticism of what he did. One should know that he was one of the "experts" called in by Lech Walesa in August 1980 (along with Geremek) and was wanted to negotiate. Then he was the main adviser to Walesa and Solidarity. I am rather critical of making any mythology of Solidarity. Very quickly it was a hierarchical movement led by experts with very suspect political and economic ideas. BTW, one should also know that currently the leadership of Solidarity are making meetings with fascists. Yes. However, imagine if Thatcher came to power through leadership of the National Union of Miners! It will be interesting to see the future of Solidarity, having such an organisation at centre of Polish politics and history could become problematic for future right-wing nationalist leaders who have no anti-Soviet credentials.